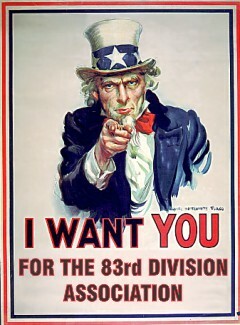 Want to become a member of the 83rd Infantry Division association? We are pleased to announce that the 83rd Infantry Division Association has expanded eligibility for Legacy Membership. We also introduce a new category – “Active Duty Membership” for those currently serving in the 83rd Army Reserve Readiness Training Center (ARRTC). All current spouses, widows, and widowers of those eligible to be a Regular Member, lineal descendants by birth or adoption to include sons, daughters, grandchildren, and great-grandchildren of persons living or deceased who are (were) eligible for Regular Membership and current spouses; and collateral descendants by blood or marriage to include nephews, nieces, grand nephews and nieces of Members, great grand nephews and nieces, current spouses and surviving widows. For the Association to continue to thrive as a national organization, to continue to honor our veterans, and to continue to preserve and promote the 83rd’s historical legacy for future generations, we must continue to grow. Our veterans’ stories, their buddies’ stories, must become our families’ stories – the daily physical danger and hardships, the seemingly impossible odds of surviving combat, the liberation of countless villages and towns … a concentration camp — all of it, the unvarnished reality of war. And to become our families’ stories, we have to share them with our families – spouses, our brothers and sisters, grandchildren and great grandchildren, grand nephews and grand nieces. We firmly believe that the Association can serve as a catalyst by reaching out to all Legacy candidates to join us – starting with our own family members. 3-year memberships provide the Association with additional financial stability as we move forward with our plan to preserve the proud legacy of the 83rd for future generations. All the benefits of membership are listed below. But the greatest single benefit is preserving and sharing the legacy of all the proud members of the 83rd Infantry Division and its attached and successor units. As a current Association Member, we thank you for the loyalty and faith you have shown by maintaining your membership. Regular, Legacy and Associate members receive one copy of the Thunderbolt magazine mailed twice yearly. Active Duty members will be mailed the magazine upon request.